It’s official — Nikon has announced its entry into mirrorless cameras with the Z 6 and Z 7 camera bodies. The Z 6 packs a 24.5-megapixel sensor, while the Z 7 has 45.7 megapixels. While the cameras are virtually the same on the exterior (minus the Z 6 and Z 7 branding), the internals feature some important distinctions. Nikon’s new mount, the Z-mount, is Nikon’s first new lens mount since 1959 when it introduced the F-series lenses that are still current on their DSLR cameras. It promises to deliver better reliability and higher performance, allowing for apertures as fast as f/0.95 and a flange focal distance of 16mm. At 24.5 megapixels, the Z 6 is weather-sealed and has 273 autofocus points with shooting speeds up to 12 fps. It features a tilting touchscreen and will shoot 4K video at up to 30p. The Z 6 features 5-axis in-body vibration reduction and an ISO range of 100-51200. It has a single XQD card slot and comes with built-in Bluetooth and wi-fi. The Nikon Z 6 will be available in late November and is available for pre-orders today for $1996.95 (body only) or $2596.95 (with the 24-70mm f/4 lens). Like the Z 6, the Z 7 is weather-sealed and features a tilting touchscreen. At 45.7 megapixels, it can shoot 4K video up to 30p and also offers an 8K time-lapse mode. The Z 7 is, by all means, a high-resolution camera, similar to Nikon’s current D850 DSLR. It has 493 autofocus points with shooting speeds up to 9 fps. The Z 7 also features 5-axis in-body vibration reduction and a slightly lower ISO range of 64-25600. It has a single XQD card slot and comes with built-in Bluetooth and wi-fi. The Nikon Z 7 will be available starting Sept. 27 and can be pre-ordered now for $3396.95 (body only) or $3996.95 (with the 24-70mm f/4 lens). Using the same F-lens mount system since 1959 means that a great lens adapter is necessary, and the FTZ adapter is exactly that. While it does what you’d expect — easily connect your current F-mount lenses to the Z 6 or Z 7 bodies while keeping the in-body vibration reduction. It also allows for Nikkor F-mount lenses to retain its lens vibration reduction, in addition to the in-body vibration reduction available on the Z 6 and Z 7. The FTZ Adapter will be available Sept. 27 for $249.95. You can pre-order the FTZ Adapter from B&H. In addition to the Z 6 and Z 7, Nikon also announced a few mirrorless lenses. The 35mm f/1.8 S will be available Sept. 27 for $849.95, while the 50mm f/1.8 S will be available in late October for $599.95. 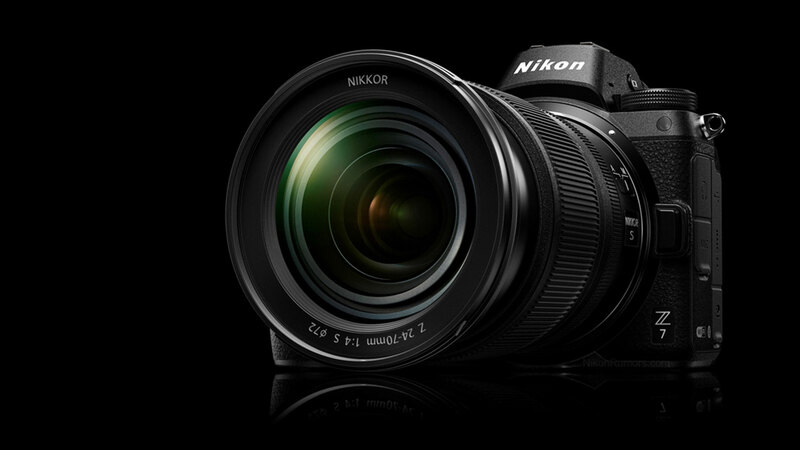 Also available is a 24-70mm f/4 S. It will be released Sept. 27 for $999.95. The much-anticipated 58mm f/0.95 S Noct was also shown during the presentation, as well as plans for several other lenses in the future. The 58mm f/0.95 S Noct is set to be released in 2019, along with five other lenses as shown below. The MB-N10 Multi-Power Battery Pack is also currently in development and will hold two EN-EL15b batteries. It will also support USB charging. One other thing to note — all existing Nikon accessories will continue to work on the Z 6 and Z 7 camera bodies. This includes existing flashes and other hot shoe accessories. To pre-order, all the cameras, lenses and accessories offered by Nikon, visit B&H Photo and Video.